Don't waste your precious cash! Be a savvy spender with Wotif. What's the secret, you may wonder? Easy, we can bundle your flights and accommodation into one neat little package. More savings means more money to put into experiencing Glenorchy. How does an additional $341* sound? That's what you could save if you act soon. And remember — you've got the flexibility to pick and choose from more than 550 partner airlines and 665,000 properties. Wotif has some of the most competitive prices under the sun. So quit fantasising and start creating new experiences. You'll have to get a wriggle on if you want to book accommodations in Glenorchy. There are only 4 available properties in the surrounding area. 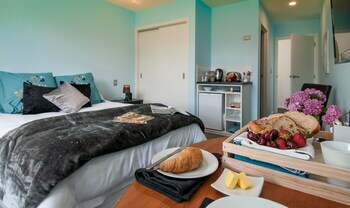 Whether you're planning to spend lots of time under the soft covers or you think you might be out and about for much of your holiday, the Blanket Bay and Glenorchy Lake House are fantastic options. At Queenstown International Airport you have plenty of options. Alamo Rent A Car and Firefly always have some superb bargains on offer. You'll also find some good deals at Hertz and Budget. All of these companies are close to the airport terminal. Planning to visit Glenorchy? Yay! Fun and thrills are in store. But how about researching a little about this amazing destination before you head off? Want to know where Glenorchy is in relation to Wellington? You'll locate this town 650 kilometres southwest of the nation's capital city. And 30 kilometres to the southeast of town, you'll hit Queenstown. Don't want to have a run-of-the-mill trip away? Then it's time to have a go at something a little different! After all, it's those new experiences that make travel great. Let the peace and quiet of nature wash over you when you spend a few nights at Routeburn Shelter. After more ideas? Show the locals how it's done with a game of golf at Glenorchy Golf Club. And you won't have to stop there. Go walking through Routeburn Track. Be sure to give yourself enough time to stop and appreciate the surrounding view. Got some free time on your hands? You could waste it buying dodgy souvenir spoons to add to your collection. Or you could explore the region's other highlights, like Dalefield. 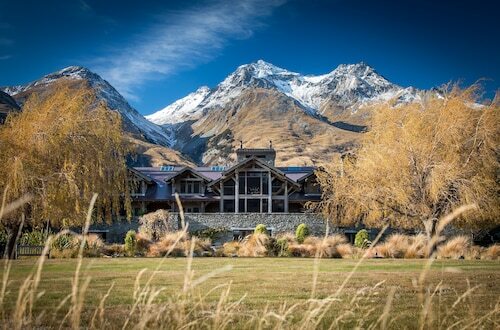 It's 30 kilometres away and offers easy access to Coronet Peak Ski Area.